A nearby balloon dips into the Rio Grande for a "splash & dash"
Some nearby balloons take advantage of the "Albuquerque Box" winds in order to land back at the takeoff point. 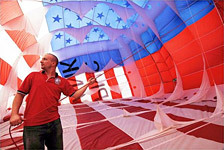 Please read all the information on this page for nearly everything to expect about your hot air ballooning experience. Contact us with any other questions that are not included here and we'll be glad to provide an answer! Click here for our policies, terms, waiver, and other important information. • Where do we go ballooning? • When do we fly? • Where and what time will we need to show up? • How long will the hot air balloon ride be? 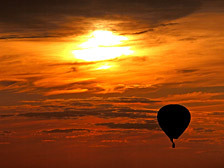 • What is included in the price of a hot air balloon ride? • How far in advance do I need to reserve a flight? • What if I need to make changes to my reservation? Are there any refunds? • How many people will fit in a balloon? How many other people will be flying with us? • How long will the whole experience take? • How high / fast / far will we fly? • Can we fly over my house? Can you steer the balloon? • Where do we land? Back where we started? • Then how do we get back? • Are there any age requirements? • Who can fly? Are there any restrictions? • I'm pretty sure I'm afraid of heights! Will I have a problem? • What about motion sickness? • What weather conditions are required? • Is it colder up there? • Can I bring a camera? • What else can I bring aboard? • Can other people come to watch? Can family or friends follow in their vehicles? • What about a gratuity for the pilot and crew members? • I really enjoyed the flight! How can I possibly return the favor? 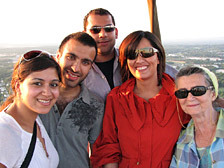 Hot air ballooning is an activity that is best suited for areas away from major population centers. 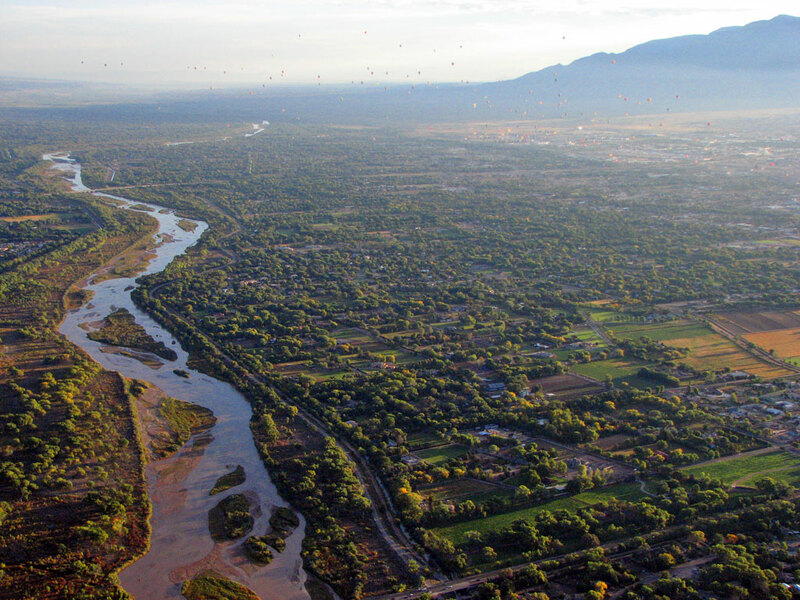 Thus, we launch our hot air balloon flights from non-congested areas of Rio Rancho and Albuquerque, on the west side of the Rio Grande. The scenic, wide-open countryside allows for a beautiful view and many perfect places to land. Our exact launch site will be chosen on the morning of the flight based on the forecast and actual measured winds. 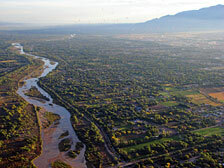 We offer balloon rides in Albuquerque seven days a week. Our flights launch once per day, at sunrise - weather permitting. This time is when the winds are calmest to allow for a most enjoyable flight. Occasionally we will fly two flights per morning. During the middle of the day and late afternoon, it's usually too unstable to fly due to thermals and wind gusts. As an added bonus, sunrise is the most breathtaking time of day for balloon photography. The vivid light and rich color of the low sun on the horizon allows for many fantastic photo opportunities. Because of the Albuquerque International Balloon Fiesta®, the first full week of October is our busiest time of year - especially on the weekends. Book early in the season to ensure your preferred Fiesta flight date is available. This year's Fiesta dates are October 7-15, 2017. 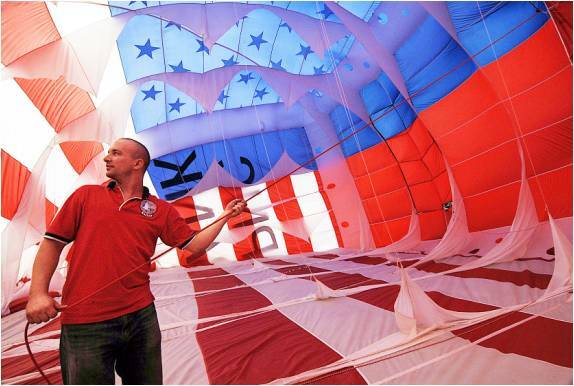 Where and when do the Balloon Festival flights meet? The meeting location for our Balloon Festival flights is Mariposa Basin Park, at 4900 Kachina St NW, Albuquerque, NM 87120 (see map below). 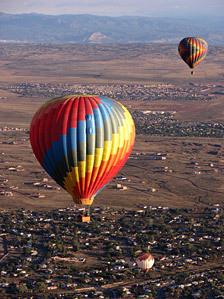 Our meeting time is 6:30 AM for Albuquerque Balloon Festival flights in October. Be sure to arrive on time - late arrivals will be treated as a "no-show" and no refunds will be given. Look for the Apex Balloons vans and trailers which will be on location at or before 6:30 AM. Please park along the East edge of the parking lot to leave room for the balloons to inflate! We will check passengers in at a table at the Northeast corner of the parking lot. 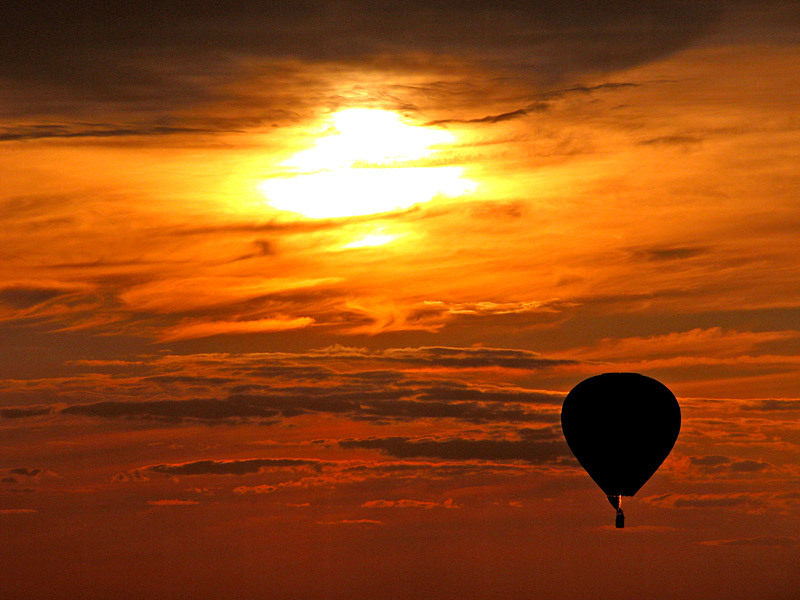 Balloon flights during the balloon festival can range from 40 to 60 minutes in length. Duration of flight depends on many variables such as wind and weather conditions, potential landing sites, payload, altitude, temperature and other situational considerations. We certainly love to fly, and will try to extend the flight as long as possible. The ultimate decision on flight length is based on safety and is determined solely by the pilot-in-command. The whole experience usually takes about three to four hours from beginning to end, so plan on being with us for at least that long. Come equipped with a sense of adventure! 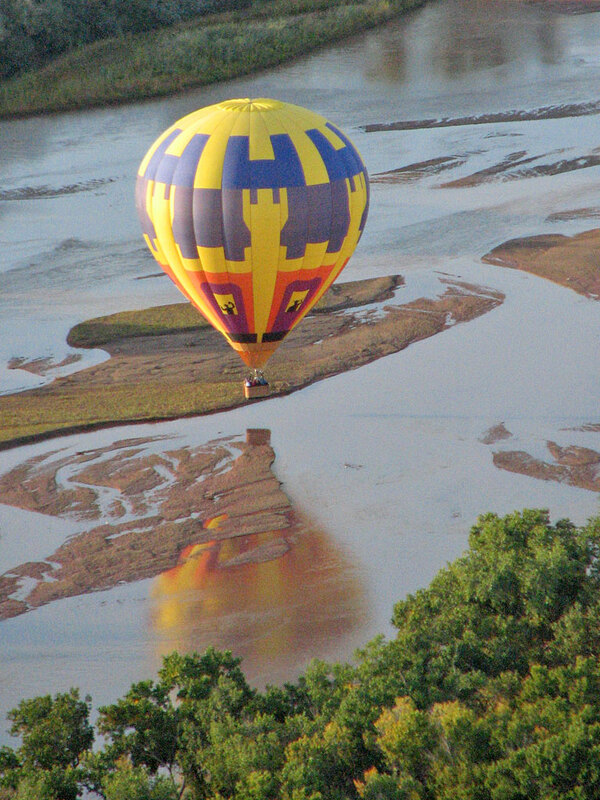 • Flight time of approximately 45-90 minutes (Balloon Festival Flights are 40-60 minutes). Ah, our number one question! 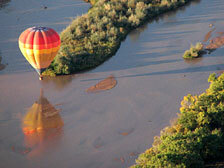 See our pricing section for hot air balloon flight fares. All prices are per passenger. Yes, reservations are a must. You may use our convenient online reservation system to check availability and book your flight. 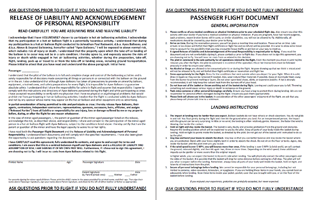 Click on a flight option below to begin the process. Schedule as early as possible, and plan ahead. Weekends always tend to fill up first, being the most popular flight times. As a rule of thumb, we recommend booking your preferred flight date at least two weeks in advance to ensure it will be available. However, last-minute bookings and scheduling changes are always possible - just give us a call to find out if we have immediate availability. We can sometimes schedule your flight on very short notice - occasionally same-day service (if you're up that early!). If you're planning to reserve a flight with us during the time of the Balloon Festival (Oct. 7-15, 2017), we recommend booking as early as possible in the season. Our Festival schedule fills up very quickly, especially the weekend flights. We have a generous cancellation policy to protect everyone in case plans happen to change between the time of reservation and the scheduled flight time. Cancellations and changes to your reservations can be made up to 48 hours prior to the scheduled flight time with no consequences (full refund). Cancellations within 48 hours of flight time carry certain penalties. The hot air balloons in our fleet range in capacity from ten to a very comfortable twenty-four passengers (plus pilot, of course!). For occasions such as corporate functions, company outings, team-building adventures, workshops and other special events, we specialize in large group flight excursions. With advance notice, we can easily handle parties of 30 or more in multiple balloons. This offers the atmosphere and excitement of a private hot air balloon festival! Plan to be with us approximately three to four hours from the meeting time. We will meet at our predetermined location, take the time to get to know all our passengers and introduce our pilots and ground crew members. Groups will be assigned to their pilot and we'll then proceed to the launch field. The preflight briefing will then be given during which the pilot and crew will explain everything and answer any questions. Guests are more than welcome to assist in the setup and inflation of the hot air balloons, or they may choose to observe and take photos. Once the inflation process begins, it will only be a matter of minutes before you will take to the sky in your beautiful balloon! The flight can range anywhere from 45 to 90 minutes. Flights during the Balloon Festival are 40-60 minutes. When it's time to land, our experienced ground crew will be close at hand to assist with deflating and packing up the hot air balloon for return to the meeting location. After the flight, we will join in a customary champagne celebration to toast our balloon flight (non-alcoholic refreshments always available). Since balloons only travel as fast as the wind is blowing, we won't go much faster than 8 to 10 miles per hour near the ground. If the winds low to the ground are any quicker than that, takeoffs and landings become a bit tricky. In those cases, we may decide not to fly. See our weather requirements for more details. We will usually cover a distance of anywhere from 2 to 10 miles. Occasionally we will be able to make a round-trip journey using the famous "Albuquerque Box" winds, landing right back where we launched from! 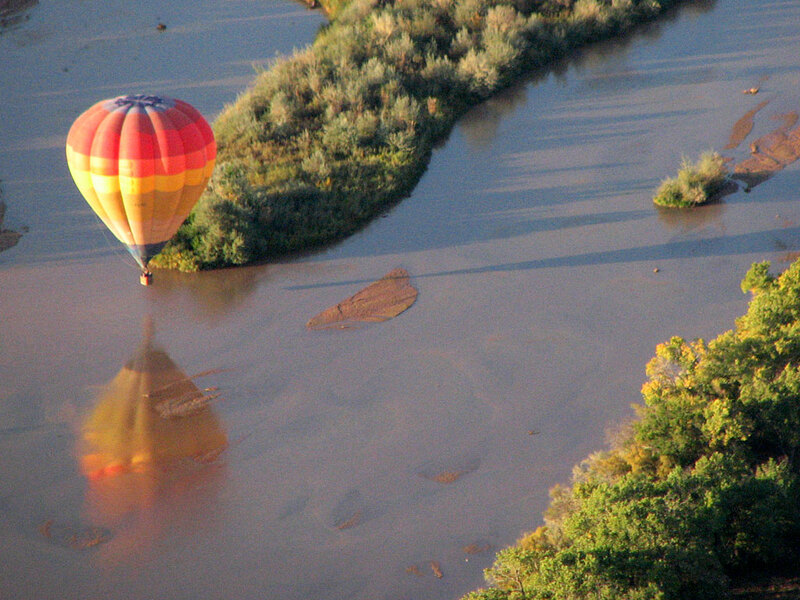 As to how high we'll be soaring, we can fly anywhere from Rio Grande level to many thousands of feet up! We always like to climb up high initially to give passengers an expansive vista from a few thousand feet up. Down low near the ground is arguably the most enjoyable part of any flight. You'll be able to skim low over the open desert, scare up jackrabbits, roadrunners, and maybe even a coyote, and converse with earthbound folks as we gently float along. If our flight path takes us over the Rio Grande, we'll try for a splash & dash - where we float along on the surface of the river without even getting our feet wet - like walking on water! Sometimes these wind changes are so significant that we can actually land close to where we took off from, but usually we'll only have a few degrees of "steerage" to work with. That is often enough directional control to be able to pick out specific downwind landing spots or waypoints from long distances away. In practice, we can usually target an intended landing area soon after liftoff. Our ground crew can venture ahead and wait there for us to land. Not always. Since balloons travel with the wind and can't be steered, we will land wherever the wind takes us - downwind from the launch site. Sometimes we will actually be able to land back where the flight began. A round trip flight requires winds aloft blowing in the completely opposite direction from those on the ground - the famed "Albuquerque Box." 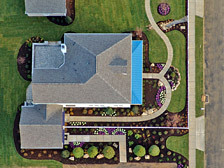 Many of our landings occur in yards, parking lots, cul-de-sacs, housing developments, less-traveled streets, schools, parks and open fields. You'd be surprised where we can actually fit a hot air balloon! Hmm... Good question! Actually, our ground crew will follow our path on the ground and should arrive before, during, or slightly after our landing. They'll help us pack up the balloon, and we'll return to the meeting location in the balloon chase vehicle, which in our case are comfortable passenger vans. There are no firm age limits on who can fly. Children are always welcomed, however they should be at least 42 inches tall to be able to see over the basket edge. We don't recommend children under six years of age, mainly because they'll have to stand still for an hour. Most kids that young will get fidgety and restless after a few minutes of standing in the same place. As well, many youngsters are afraid of the loud noise the burner makes. However, if you're sure your young child will be willing and able to behave well, we'll be glad to have them join us on the balloon flight. On the other end of the spectrum, there is no such thing as "too old." We have carried a handful of passengers over 90 and even a few over 100 years of age! Nearly everybody is welcome to fly with us! We've flown passengers from age 5 to 102. However, there are a few requirements we need to stand by to make the ride pleasant and enjoyable for all. You should be in good physical shape with no recent surgeries, broken bones, joint replacements or other medical issues which may affect your ability to take part in a physical activity. 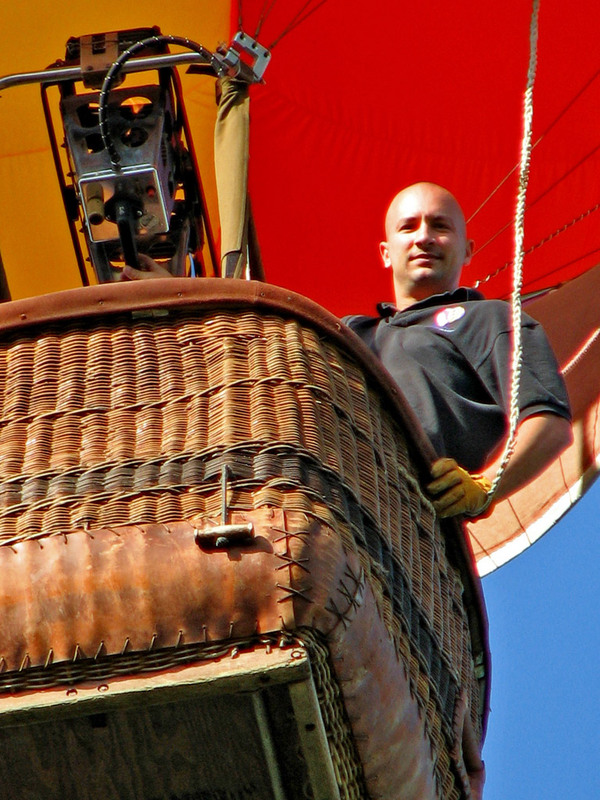 Although there are places to sit in the basket if necessary, you'll need to be able to stand for the duration of the balloon flight (at least one hour). It is important that we be informed of all potential medical/physical problems at the time of flight reservation. In most cases there is no reason for us not to fly a passenger, but we do need to be aware. The safety of our friends and passengers is paramount. See our policies section for more details. Per FAA regulations, passengers under the influence of drugs or alcohol cannot and will not be flown. Refunds will not be given for those who arrive in a such a state. I'm pretty sure I'm afraid of heights! Will I have a problem? Acrophobia: The fear of heights. I'll venture to guess perhaps 80% or more of all our passengers have some degree of apprehension about leaving the ground. For those passengers who are adventurous enough to conquer their own fears and take to the air, 99.9% of them get back on the ground and vow to come back and do it again with us! 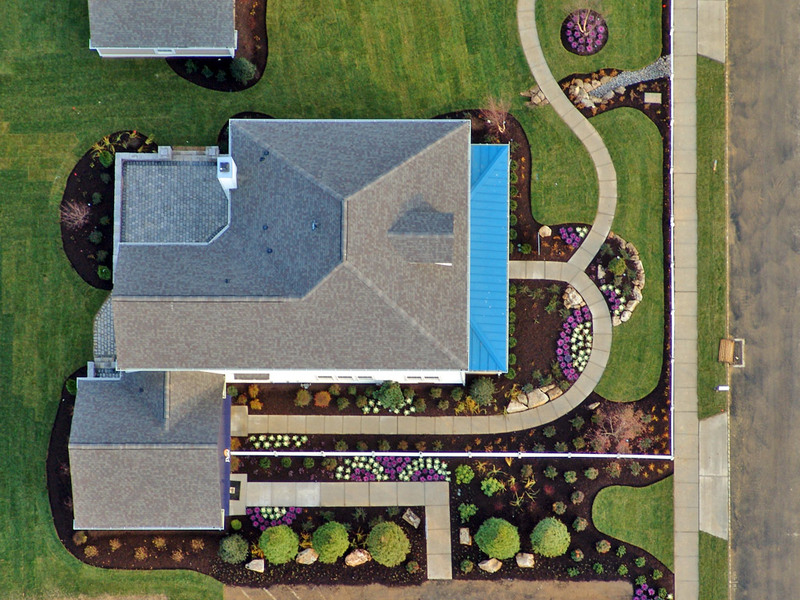 When looking straight down the side of a tall building, parking garage or similar high place, you are able to visualize your physical connection to the ground. This actual perceived height is what makes you step back from the edge, grasp that railing a little tighter, or in extreme cases, get a little sick to your stomach. Not fun! However, in a hot air balloon basket, there is no visible connection to the ground. This detachment from the earth essentially removes any uneasy sensations of height. Furthermore, there is no relative altitude in a balloon - whether two feet above the treetops or two thousand feet up, it all feels the the same. But the view is much better from up high! We're sure you'll have no worries once you're up there. If you can get past your initial concern about leaving the ground, you'll be just fine! Turbulence is unheard of, as we are not fighting the wind like an airplane has to. Since the hot air balloon floats along with the wind, there's no movement to worry about. Balloon flight requires ideal weather conditions, which luckily are present 300 mornings out of the average year in Albuquerque. However, just because it's a beautiful sunny day, understand that it may not necessarily be a perfect day to go flying. The wind speed must be less than 8 to 10 miles per hour, and there must be no thunderstorm activity within 50-100 miles. Balloons don't fly in the rain. Even if has stopped raining recently before flight time, there may be more bad weather on the way. Weather cancellations can and do occur, so please have patience. Sometimes we just cannot fly on your chosen date. We will reschedule you at a convenient later date as many times as necessary until your flight is completed. If you cannot reschedule after a weather cancellation, a refund of your flight deposit will be allowed. Gift certificates will not be refunded due to weather cancellations. If you have left a credit card on hold for your deposit, it will not be charged. The October mornings are usually very chilly before sunrise (30-50°F), so dressing in layers is recommended. Once the sun comes up, it warms quickly. It is not uncommon for the temperature to rise to more than 70°F by the end of the flight, which can feel more like 80°F in the high desert sun. Dress accordingly. It's best to wear clothes that you aren't afraid to get dirty, although we certainly won't aim to do that! Appropriate clothing for ballooning are jeans, sneakers/hiking boots, and natural materials rather than synthetic. Passengers should wear a hat, as the burners generate a fair amount of heat. Shorts and skirts may not be suitable for some of our landing spots. Hiking boots, sneakers, or a comfortable flat shoe are the preferred footwear. Heeled shoes and open-toed footwear (sandals) should be avoided. The temperature will feel nearly the same up in the balloon as it is on the ground. The temperature drops a constant 3.5°F per 1,000 feet above sea level. Our flights generally climb to heights of 1,000 to 3,000 feet above the ground, so the coldest it would usually get on a normal flight would be about 10-12°F cooler than ground temperature. Absolutely! You are encouraged to bring along a camera, digital camera or small video recorder. You'll be able to capture beautiful pictures aloft to remember your flight by and to show friends your exciting adventure. However, please have a neck or wrist strap, and make sure to bring a padded bag or case to stow your camera in before final landing (not hanging from your neck). We cannot be responsible for personal belongings. Bring twice as much film/memory as you think you'll need, and then some. Many people fill up their memory cards or run out of film in the first few minutes after liftoff! We carry bottled water on our flights, and offer to carry refreshments of your own on board as well, if needed. There is sometimes enough room per passenger for a small handbag, but anything beyond yourself and a camera is best left on the ground in your locked vehicle, or we will gladly carry it in the balloon chase vehicle so it can be there when we land. Can other people come to watch? Can family or friends follow in their vehicles? Sure! Others are welcome to follow behind our ground crew in their own vehicles. If it is an exclusive flight, we will usually offer friends or family the chance to ride along in the chase vehicle. This allows them to be a part of the action if desired, which is nearly as much fun as flying! Our ground crew members put in long hours and lots of effort for the love of hot air ballooning. Although tips are not required, these hard-working individuals greatly appreciate the gesture and gladly accept tips. Like any personal service, if they do their job well, it shows appreciation for their attention to your enjoyment. An appropriate amount might be 10-15% and can be given to your pilot to distribute evenly among the ground crew. I really enjoyed the flight! How can I possibly return the favor? Spread the word by telling a friend! Word-of-mouth is quite important to us. We love to take up friends of customers, and often have repeat customers returning year after year. Perhaps you might also be interested in sharing some kind words or photos for the feedback page? For hot air balloon rides in Albuquerque, New Mexico, call us at 505-333-8511, or call toll-free 1-877-9-HOTAIR (1-877-946-8247). You may also email us, but phone contact is best since there's not always time to respond to emails when we're busy flying often. 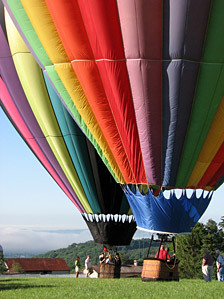 For Balloon Festival flights, payment is made by credit card at the time of booking. See our cancellation policy below for more details. Weather cancellations can and do occur, so please have patience. Occasionally, we cannot fly on your chosen date. Weather cancellations can be rescheduled at your convenience. Previously-scheduled flights will have priority (first scheduled, first priority). We will reschedule you as many times as necessary until your flight is completed. If you cannot reschedule after a weather cancellation, a refund of your flight deposit will be allowed. Gift certificates will not be refunded due to weather cancellations. If you have left a credit card on hold for your deposit, it will not be charged. • Weather conditions that are preferred: Winds under 8-10 miles per hour, no precipitation, good visibility. • Inability to stand for extended periods, reliance on a walker/cane, etc. In most cases, we should be able to accommodate the passenger in question; however, we need to know what limitations may be present so we can plan for a safe experience. If in doubt, consult your physician about the suitability of a balloon flight. Keep in mind the possible landing situations that may be experienced. Unfortunately, wheelchair-bound passengers cannot be accommodated in our balloons. There are only a handful of specially-equipped wheelchair hot air balloons in existence in the world. • Cancellations or reservation changes at least 48 hours prior to the meeting time are permitted. Perhaps plans have changed or there is a scheduling conflict that has come up? That's perfectly fine - just let us know at least 48 hours before the flight meeting time, and there's no penalty whatsoever. A full refund will be given for any flights that are pre-paid. • Cancellations within 24-48 hours of the meeting time will result in forfeiture of 50% of the total flight cost, or the equivalent amount charged to the credit card on hold. • Should you fail to show up at the scheduled meeting time, or cancel less than 24 hours in advance of our meeting time, the full flight fare is due, and no refund will be given. Failing to show up at all - or arriving late enough to miss the flight - is considered a "no-show." There are no refunds in this case. Last-minute notification for cancellations must be made by phone. Call us at 505-333-8511, or call toll-free 1-877-9-HOTAIR (1-877-946-8247) to make any scheduling changes or cancellations. Our meeting time is 6:30 AM for all Albuquerque Balloon Festival flights in October. The first flights launch just after sunrise, approximately 7:00-7:15 AM. The "Second Hop" flights launch approximately 8:15-8:30 AM, immediately after the first flights land. All passengers on either flight will meet at 6:30 AM. For year-round balloon flights, please confirm the specific meeting time when you check in on the day prior to the flight. If you need directions, are lost, or are running late, call us anytime at 505-333-8511.